Just several days after taking a Brian Rolston shot off of the mask, New York Islanders goalie, Rick DiPietro has been diagnosed with a concussion and is out indefinitely according to the Islanders Twitter feed. This being the latest injury in the oft-injured DiPietro's career. A career which is highlighted by a contact signed in 2006 that locked DiPietro up for 15 years with a $4.5 million annual cap hit. However, injuries have recently kept DiPietro from being the Islanders' go to goalie. Last season, after DiPietro suffered facial fractures (pictured above) courtesy of a one punch knockout by Brent Johnson, of the Pittsburgh Penguins, Scott Lewis at the Score was generous enough to put together this snapshot of DiPietro's history of injuries. 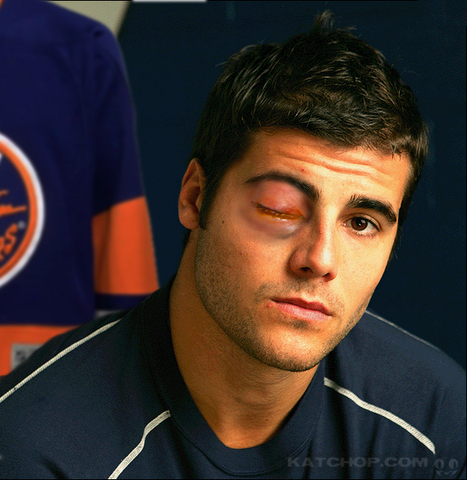 Those injuries have limited DiPietro to just 39 games played since the beginning of the '08-'09 season. Now DiPietro will have to go through the necessary steps that goes along with recovery from a concussion. Hopefully he doesn't stub his toe while hes is recovering because who knows when we'll see him back on the ice if that happens. That black eye was given to him by his own family members when he demanded to play net because he's tired of being "injured".